Immortalised in Henry V as ‘this wooden O’, the Curtain Theatre in Shoreditch was home to Shakespeare’s company of players until the completion of the Globe in 1599. Yet despite staging some of the playwright’s most famous works, barely 50 years after its opening in 1577 the theatre faded into obscurity and was lost— until now. Chris Thomas told Carly Hilts what has been found. 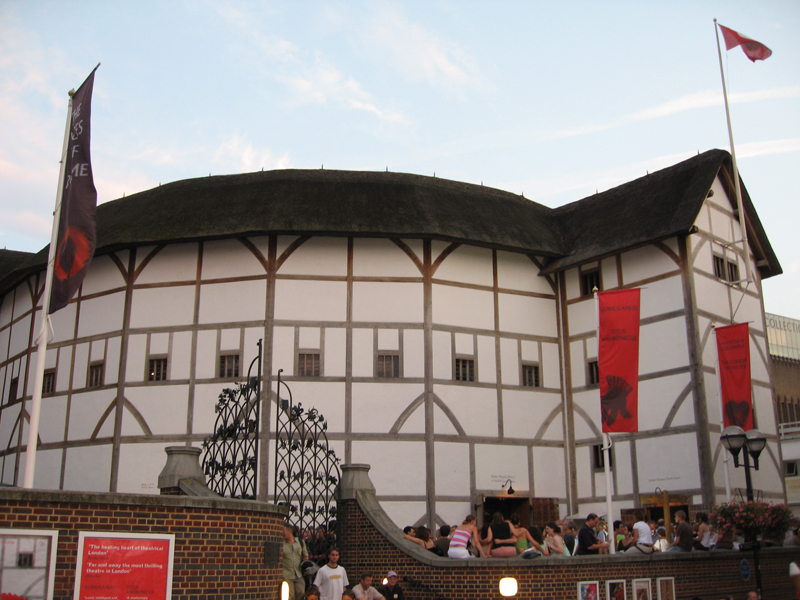 In 1597, following a dispute with their landlord, a group of disgruntled actors literally upped sticks, dismantling their theatre and transporting its timbers to Southwark where they were used to build a new playhouse: the Globe. The players were the Lord Chamberlain’s Men, and among their number was an up-and-coming performer and playwright called William Shakespeare. But where were the men to earn their living while the Globe was under construction? The answer came in the form of the Curtain, just 200 yards from their old home (imaginatively called ‘the Theatre‘ – see CA 225), whose owner had entered into a profit-sharing deal with their managers 11 years previously. For the next three years this became the main venue for Shakespeare’s plays, probably staging the first performances of both Romeo and Juliet and Henry V. The Curtain also bore witness to Shakespeare’s burgeoning acting career, with a playlist recording his appearance as ‘Kno’well’ in a 1598 performance of Ben Jonson’s Every Man in his Humour. But a year later the Lord Chamberlain’s Men departed for the Globe, and by 1628 the Curtain had vanished from historical records. Although the name of a local street, Curtain Road, hinted that the theatre had once stood nearby, its precise location was lost to memory. 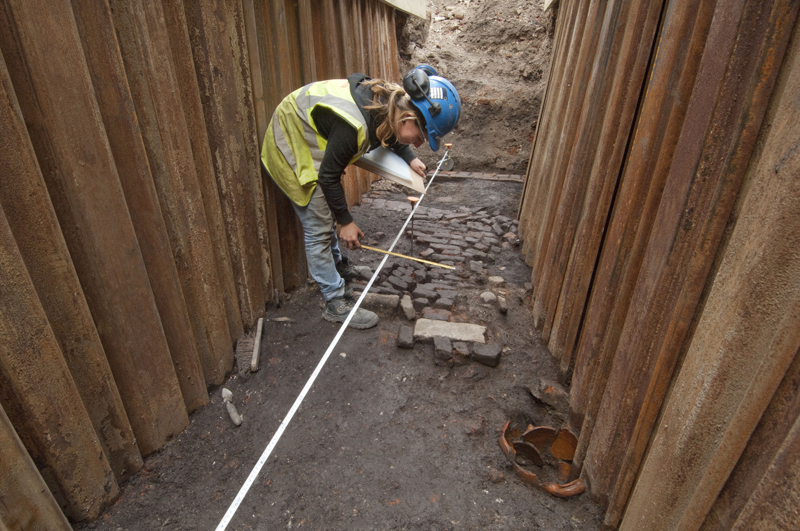 This all changed last October, however, when Museum of London Archaeology (MOLA) was called in to investigate a Shoreditch site ahead of planned redevelopment work. 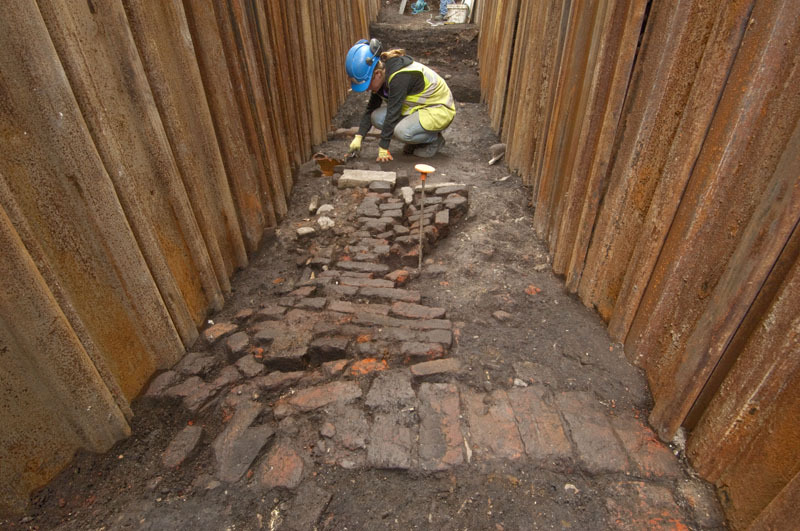 Just two narrow exploratory trenches were put in, but these uncovered tantalising signs of one of the best-preserved Elizabethan theatres ever excavated. 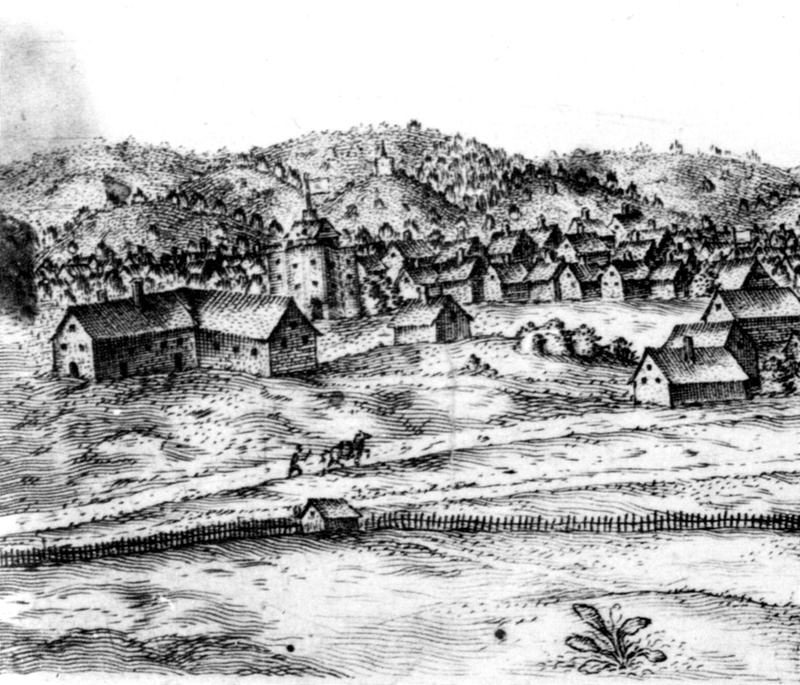 Despite extensive urban growth in the area since Shakespeare’s day, investigations found that the Curtain had escaped serious interference. Sections of the brick inner wall of the theatre still stand to their full height. This would have separated the yard, or ‘pit’, where standing audience members known as ‘groundlings’ could watch performances for a penny, from the galleries where more affluent theatregoers could pay another penny for a seat, and one more for a cushion. Behind this, MOLA archaeologists found part of the intact gravel surface of the yard itself, and on the other side the brick floor and piers that would have supported tiers of wooden seats. Chris Thomas, who led the excavations, explained what they had found. Although the site will not be fully excavated until next year, preliminary findings suggest a layout similar to that of known theatres such as the Rose, investigated by MOLA in 1988 (CA 115), or the Globe, rediscovered a year later (CA 124). If the Curtain was a typical Elizabethan playhouse, this would mean a polygonal building with the stage projecting into a large central yard that was open to the sky. Around this would have stood three-storey tiered galleries. Today, little remains of contemporary playhouses like the Theatre, while the original site of the Globe lies beneath a listed 18th century terrace, but further exploration at the Curtain has great potential to reveal more about how playhouses operated in Shakespeare’s day. While the Curtain’s architecture seems remarkably well preserved, evidence of day-to-day life at the theatre has so far been limited – unlike at the Rose, where archaeologists found hundreds of artefacts as well as floors littered with fruit seeds and shells from hazelnuts, perhaps the popcorn of Shakespeare’s day. In these latest investigations MOLA found broken pieces of clay pipe that could be contemporary with the theatre, but other small finds, including fragments of china and wall tile, were rather later in date. Chris Thomas has high hopes for finding more Elizabethan objects in the future, however. Let’s preserve our old arhitectures. Everyone loves to see a theatre especially kids. They love to be a part of the theatre. Shakespeare is known especially in books but its really amazing when you see it in theatre.